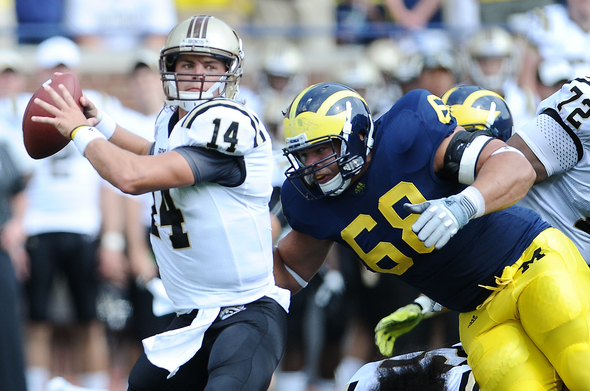 Posted on Wed, Mar 21, 2012 : 12:06 p.m.
Former Michigan captain Mike Martin puts pressure on Western Michigan quarterback Alex Carder during a game last season. Martin, who is preparing for the NFL Draft, dropped in on the A2Y Chamber meeting Wednesday morning. Brady Hoke was a little out of his element speaking to a group of Ann Arbor and Ypsilanti businessmen Wednesday morning, and was under a tight schedule after a Tuesday practice had to be rescheduled for 5:30 a.m. that day. His speech began around 8:30 a.m. In the front row, though, he found a familiar face: Mike Martin, the former captain of the Michigan football team who is in the thick of his NFL Draft preparation. The defensive lineman participated in the scouting combine the last week of February, then the Wolverines' pro day Thursday. He was put through an extensive workout by the New England Patriots on Monday, and the Tennessee Titans will host him for a meeting the first week of April. Martin has dollars and dreams riding on these next few weeks. Yet, there he was, attending a 7 a.m. chamber of commerce meeting at the Kensington Court hotel in Ann Arbor. Not as a speaker — just another audience member. So, Mike ... uh, why? "It's always been a dream of mine to own my own business," he said. "I’m new to business, but I always believed I’ve had an entrepreneurial spirit, whether it was when I was little, selling lemonade at my mom’s garage sales, or pop can drives or something like that." Martin was enjoying himself as just another face in the crowd, but was unexpectedly called to the stage after Hoke finished speaking to the near-capacity crowd of A2Y Chamber members. He discussed his career in football and how he expects it to translate to the business world, where he lately has developed a keen interest. He said he has a couple entrepreneurial ideas, although he declined to elaborate since they still are in the formative stages. and I’ve had great coaches and great mentors who have taught me, and I think that parallels from life, business, school, football, whatever it might be. It’s all connected." Martin, like Hoke, addressed the similarities between business and sport and how success in both is tied to strong leadership. He said that's a lesson he learned from the two coaching changes he endured at Michigan, when he saw the team splinter under Rich Rodriguez and unite under Hoke. He saw the latter happening on Hoke's first day. "He brought in the seniors (on his first day) and looked us in the eye and said, 'If I have to lead this team, we will not go where we want to go this season. We won't get there,'" Martin said. "It was our chance to turn it around. Because as a freshman, I saw it go the other way, where a coach (Rodriguez) comes in and guys didn’t buy in. ... You had a senior group that some guys were pulling in this direction and other guys were pulling in that direction, and you can’t have that. You can’t have that on a team, and you can’t have that in a business." Hoke said a key to success next season will be cultivating another strong leadership group among the seniors, after the graduation of Martin and fellow captains Kevin Koger and David Molk. It's the one constant that has followed him during successful stints at middling programs Ball State and San Diego State, as well as Michigan. The second ingredient is staying hungry. "Guys get complacent; that’s when you always go backward in life, in business," Hoke said. "That’s part of our expectations. When those guys walk into the building, someone’s going to beat you out (if you're not getting better). "If you’re a 3.2 student, be a 3.2 student. If you can be a 3.2 student and you’re a 2.4, then you’ve cheated yourself." Hoke famously said upon his arrival at Michigan that, in his early years as a player at Ball State, his goal "was to drink all the beers in Muncie, Indiana." It's a story he often relays to players and recruits as he tries to build on last year's 11-win season. "I can’t let them cheat themselves," he said. "Mike, he’s heard it before. Every recruit, I tell them that story. And my coaches tell me, 'Why do you tell them that?' And I say, 'because it’s the truth.'" Thu, Mar 22, 2012 : 8:09 a.m.